His six (6) month old baby son Ali Asgher, dying of thirst in his cradle. And the poor mother Rubab, whose milk had dried up by the continuous thirst and hunger, could not help the baby with even a drop of milk. Telling the mother that he would show the baby to the enemy and get some water for it if they give it, Imam Hussain (AS) took the baby to the battlefield by covering with his robe and raising it up in his arms to enable everyone in the enemy’s forces to see it, and said: “O People! If, in your opinion, Hussain is guilty of any sin or crime, this innocent baby has done nothing to hurt any one of you. It does not even speak, and has not even uttered anything against you or your Amir at Damascus. He is dying of thirst. He had neither milk nor water for the last three days. 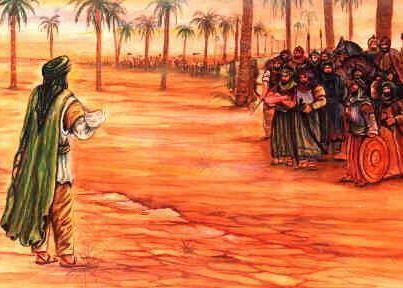 It is reported that the address of the Holy Imam and the scene, with the thirsty innocent baby in his hands, was so touching, so pathetic and so heart-rending that even the men in the enemy’s army could not help weeping and cursing the Yazid and his Deputy ‘Ubayd Allah son of Ziyad’, Governor of Kufa, who had gathered them there against such Holy ones. ‘Umar son of Saad’, fearing a revolt of his forces in sympathy for the Holy Imam, at once ordered a stonehearted brute named Hurmula to answer Hussain(AS). The tyrant, shot a arrow from his bow which after piercing through the Imam’s arm got stuck into the tiny neck of the innocent baby. Blood gushed out of his neck and splashed on to Imam Hussain’s face. Ali Asgher died in his father’s arms with his smiling face. times as if he was building his strength to face the mother of the baby who had been so brutally murdered. Labbaika Ya Hussain! We are IN YOUR COMMAND!